Uglyworld #346 - Babo In Friday Night TV Mode, originally uploaded by www.bazpics.com. With it being Friday night Babo asked if I would bring him in some munchies for while he's sitting watching TV. As I've been so busy this week he's had to wait a few days longer than normal for me to watch the latest programmes of his favourite TV series. 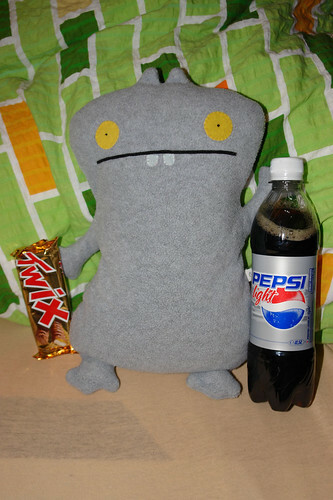 Now that he's armed with a bottle of Diet Pepsi and a Twix he's ready for a TV series marathon into the small hours tonight (I've not broke the news to him yet that I'm heading to bed early as I have to work tomorrow too).